Roger Hanin (born Roger Levy, 20 October 1925 – 11 February 2015) was a French actor and film director, best known for playing the title role in the 1989–2006 TV police drama, Navarro. Roger Hanin was born in 1925 in Algiers, Algeria as Roger Lévy to Jewish parents. His brother-in-law was François Mitterrand (the late former President of France), whose wife, the late Danielle, was the sister of Hanin's wife, Christine Gouze-Rénal. With Claude Chabrol, Hanin co-wrote the scripts for a pair of spy films in the mid-1960s. Chabrol directed Code Name: Tiger (1964) and Our Agent Tiger (1965), both featuring Hanin in the starring role of secret agent Le Tigre. 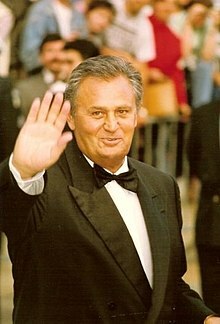 His 1985 film, Hell Train, was entered into the 14th Moscow International Film Festival where it won a Special Prize. In September 2000 he was awarded a place on the honourable list of the National Order of Merit of Algeria. He said: "I always refused decorations. This is the first time that I agree, but it's also the last because I want it to be unique. " ^ "Roger Hanin". The New York Times. Retrieved 12 February 2015. ^ a b "EN IMAGES. L'hommage parisien à Roger Hanin". Le Parisien. Retrieved 12 February 2015. ^ "Roger Hanin inhumé ce vendredi à Alger, près de la tombe de son père". EuroNews. Retrieved 12 February 2015. ^ "14th Moscow International Film Festival (1985)". MIFF. Archived from the original on 16 March 2013. Retrieved 10 February 2015. ^ "Des personnalités rendent hommage à Roger Hanin". Tribune de Genève. Retrieved 12 February 2015. ^ "Algérie: Le minot de la Casbah d'Alger est mort". allAfrica.com. Retrieved 12 February 2015. This page is based on the Wikipedia article Roger Hanin; it is used under the Creative Commons Attribution-ShareAlike 3.0 Unported License (CC-BY-SA). You may redistribute it, verbatim or modified, providing that you comply with the terms of the CC-BY-SA.